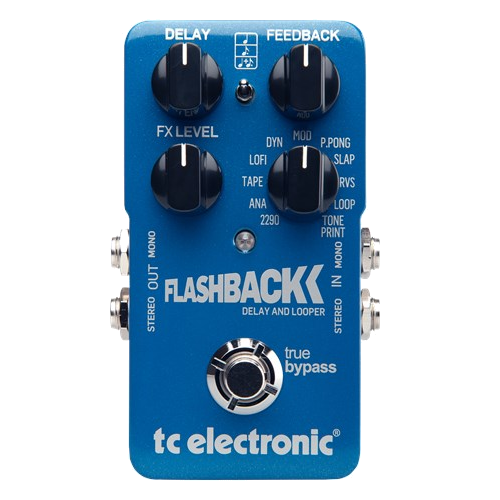 From one of the most highly regarded pedal companies in the world, comes the Flashback. This incredibly popular pedal packs a whole lot of options into a tiny footprint. TC maintains their high standards for quality of build, design, and effect with this furious little pedal. It must be noted that it is impressive how much functionality TC managed to fit in such a small pedal while making it seem simple and easy to use. At a glance, this may seem like your standard delay pedal with the basic controls, but what awaits is a vast array of delay sounds and manipulability. The audio-tap function works surprisingly well. With a 40 second looper and 10 delay types, this little pedal can do a whole lot. You will be served well in virtually any musical scenario with this stompbox. Incredibly precise and beautiful representation of your sound. While all delay types will not be pristine (by design), this pedal does great service to your sound regardless of the tonal inflections of the different delay types . Not only is this pedal filled with options, but most of those options seem quite usable. The ease of use and footprint of this pedal paired with its massive stable of options makes it a highly desirable pedal for live use. You can even use Toneprint to load up presets if you plan ahead. Tommy, Tenor Saxophone - "I have been using the TCE Flashback for about a year, and I love the 11 presets and its simplicity of use quite a lot. However, I dislike the loop effect, it is difficult to use and the knobs always get accidentally switched to undesired presets by my foot. I like to use this pedal during solos with my harmonizer pedal or alone. I also like how I can use the "tone print" app on my phone to wirelessly send delay effects to the pedal. I wish there was a more efficient tap function where I could control the time and rhythm of the delay by TAPPING the tempo in rather than adjusting the knobs or having to hold down the pedal and play a rhythm into the mic. Since I have to play into the mic to inform the tap tempo, the audience hears the first few notes without the effect, which is undesirable. I get this is not a problem guitar players have, as they can turn their sound off before playing the tap rhythm in. For this reason, the Flashback is less efficient and useful for a live show."